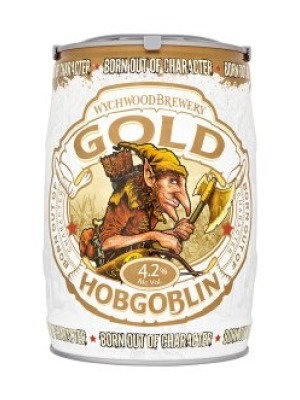 Wychwood Brewery Hobgoblin Gold is a popular Craft Beer available from Tesco Groceries in 5L to buy online. Visit Tesco Groceries for the best price for 5L of Wychwood Brewery Hobgoblin Gold or compare prices on our other Craft Beer products. Born out of character.A golden treasure hidden within the Wych Wood has been unearthed... & it's no fool's gold. The combination of four hop varieties & an infusion of Wheat & malted Barley results in a perfectly balanced golden beer - with a huge hop punch. Well what would you expect? Where to buy Wychwood Brewery Hobgoblin Gold ? Wychwood Brewery Hobgoblin Gold Supermarkets & Stockists. You can buy Wychwood Brewery Hobgoblin Gold online in most retailers and find it in the Craft Beer aisle in supermarkets but we found the best deals online for Wychwood Brewery Hobgoblin Gold in Tesco Groceries, DrinkSupermarket.com, and others. Compare the current price of Wychwood Brewery Hobgoblin Gold in 5L size in the table of offers below. Simply click on the button to order Wychwood Brewery Hobgoblin Gold online now.